Figuring out how to store, transport, and organize my ever-expanding kit has been an ongoing endeavor since I first started. I tried everything from scrap booking totes to a folding crate on wheels, luggage sets and train cases. Nothing I tried seemed to offer the right combination of organization, size, ease of transport, cost, and durability. 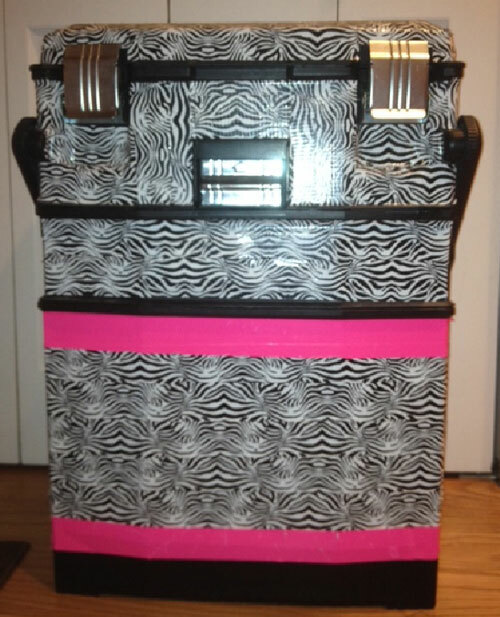 The oversized lower bin fits large items (paint pallets), the part bins organize small items (business cards, pots of glitter), and the tool box fits medium sized items (baby wipes, sponges). Another bonus that isn’t mentioned in the official specs – the walls of the part bins are removable! You can easily slide these babies out and customize the size of the compartments to suit your needs. “Durable Structural Foam” is fancy-talk for thick black plastic. Ever spilled glitter in your kit, or break a powder pallet? The smooth, rigid compartments wipe down easily, with the baby wipes you probably already have stored in there. 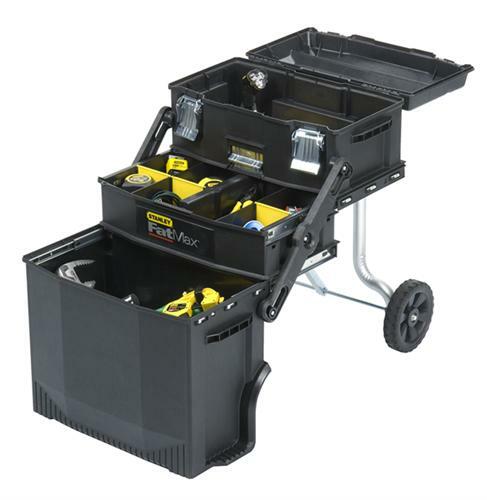 With a retractable handle and heavy-duty wheels, this thing treks easily up driveways, across fields, and down streets. It rolls around with you like a large piece of luggage, but remains stable through grass & rocks. Think about it, this was designed for big burly men who like tools. It was built to store heavy things, and take a beating at construction sites, get covered in sawdust & dirt, then get tossed back into a pickup truck. Everything from the wheels to the snap-front-locks is rugged, and built to last. 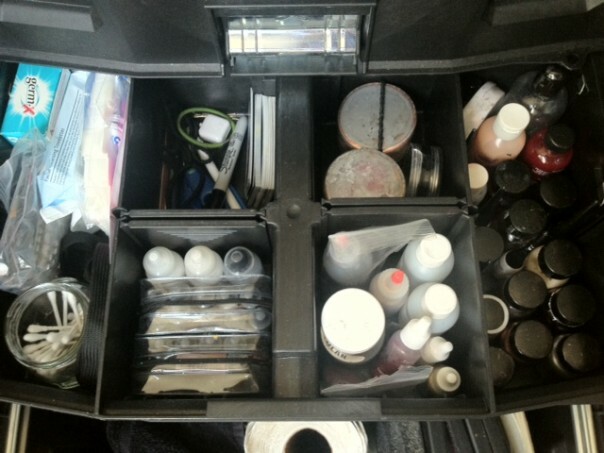 I was able to find professional makeup cases online, with comparable size & organizational options, retailing from $150-$900. The Stanley Fat Max was about $80, a fraction of the cost. I bought mine at Home Depot, Elizabeth bought hers at Lowes. There is also a smaller version for about $40. It only comes in one color, and it’s not decorative or polished looking. Understandable; I don’t think Stanley’s target market cares about color-coordinating. Elizabeth spruced hers up with fancy duct tape. Large and filled to the brim with supplies, it’s not easy to lift into my car, or haul up stairs. Fortunately, there are handles on the sides if you need some leverage. I’m no Hulk, and Elizabeth is a skinny-minny, but we’ve made it work. Lift from your legs! Finally, a kit as tough as you are!